Tibor de Nagy is pleased to present an exhibition of recent paintings by Trevor Winkfield. The exhibition titled Saints, Dancers and Acrobats will be Winkfield’s ninth solo show at the gallery, and his first at the gallery’s new Rivington Street location. Over several decades, Winkfield has been working a consistent and methodical style of vibrantly colored, hard-edged painting. For this exhibition, Winkfield focuses on figures - saints, dancers and acrobats and others depicted ready to engage in their respective roles. In these works from the past four years, he continues his practice of first making collages that the final paintings are based upon. With this method, he juxtaposes recognizable objects with fantasy or morphs forms into hybrids of the everyday and the uncanny. The overall effect is that of dreamscapes or pop surrealist tableaus. Through the rhythm of shape and form, these works are infused with an intense energy and always executed with meticulous precision. Throughout Winkfield’s career, his painting has been informed and influenced by poetry, including the work of his friends John Ashbery and James Schuyler. He is also a devotee of absurdist literature, especially the works of Raymond Roussel, whose writings he has translated. Winkfield has a passion for word play, puns and double entendres that in his paintings become a source of deft visual play. Trevor Winkfield, born in 1944, moved to New York from his native England in 1969. He has had many solo exhibitions over the last 20 years. Currently he has a solo exhibition Milton Art Bank in Milton, Pennsylvania on view until April 21, and he recently had a two person exhibition (with Kate Abercrombie) at Fleischer/Ollman in Philadelphia. He has received numerous awards, including a Pollock-Krasner Award and a John Simon Guggenheim Memorial Foundation Fellowship. In 2002, Winkfield was awarded the Chevalier dans l’Ordre des Artes et des Lettres by the French government. Winkfield is also a writer, and has written extensively about art, in essays and reviews. He is the author of two books Georges Braque & Others: The Selected Art Writings of Trevor Winkfield, 1990-2009 and How I Became a Painter: Trevor Winkfield in Conversation with Miles Champion. Tibor de Nagy Gallery presents exhibitions of such contemporary artists as Sarah McEneaney, Trevor Winkfield and Jen Mazza, as well artists from the Post War second generation New York School. Its long history includes the first exhibitions of Carl Andre, Helen Frankenthaler, Jane Freilicher, Red Grooms, Grace Hartigan, Alfred Leslie, Fairfield Porter, and Larry Rivers. The gallery’s program continues its mission to present a broad overview of contemporary art of singular vision including recent exhibitions of Hannah Wilke, Francis Picabia, and Jess. This unique history has also fostered collaborations between poets and artists. The gallery was the first publisher of the poems of John Ashbery, Frank O'Hara, Kenneth Koch, and James Schuyler. Join the conversation on social media by mentioning Tibor de Nagy and using the hashtags #TibordeNagy and #TrevorWinkfield when posting. 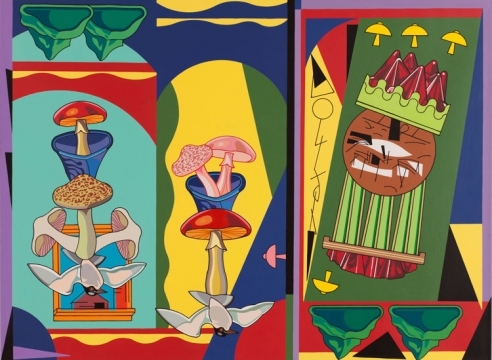 Born in Britain in 1944, Trevor Winkfield has lived in New York since 1969 and exhibited here almost as long. 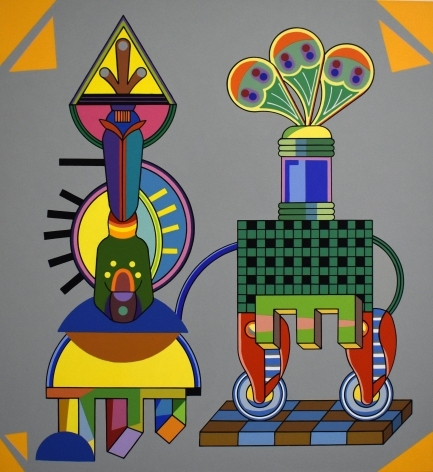 For decades, he has cultivated a style of Formalist Pop Surrealism that balances between fine and commercial art. His precedents include the proto-Pop paintings of Gerald Murphy; Paul Outerbridge’s advertising photography; and Picabia’s mechanical portraits which Mr. Winkfield might be said to have fleshed out. 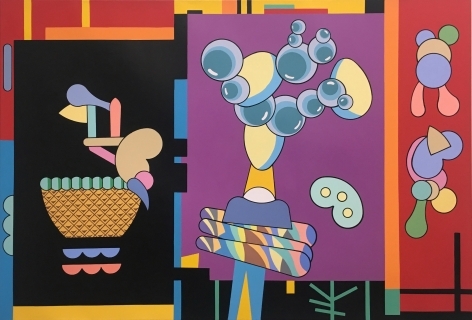 Trevor Winkfield has a small but intensely devoted following, and much has been written about this English painter who moved to New York City from London in 1969. As the editor of an important mimeograph magazine, Juillard, in the late 1960s, he became associated with poets and writers such as John Ashbery, James Schuyler, Harry Matthews, Ron Padgett, Larry Fagin, Charles North, Kenward Elmslie, and others connected to the New York School.